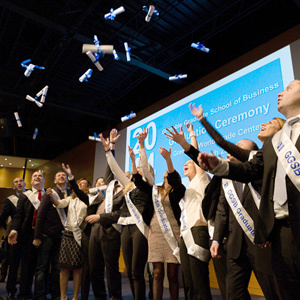 The GGSB Graduation ceremony and the International Gala took place on Saturday, March 16th, with nearly 800 guests, including 319 Graduates from the MBA, BIB, MIB and MSc programs. This year there was a record number of attendees - so many so that the graduation team had to organize a 3rd graduation ceremony as we couldn't fit everyone in the auditorium! The events were a huge success with many families, Faculty and GEM administrators attending to celebrate our Graduates' success. In the evening we welcomed 314 guests for the Gala dinner and 700 guests for the party. As Director of Alumni Relations I would like to extend my sincere gratitude to everyone who made this important day possible including all of our volunteers, coordinators and our excellent graduation team. I would like to share with you my most poignant memories of the day: The first was a young graduate from Colombia who unfortunately arrived with her parents after her class had already graduated. Ana-Cecilia (the ceremony organizer) quickly rearranged the schedule so that she and another classmate could receive their diplomas. The joy and pride on her father's face as she stepped up on the stage was overwhelming. As the two classmates stood on the stage with their diplomas, their classmates spontaneously jumped up and joined them for a group photo. It was an exceptional moment that expressed the GEM Attitude of respect, tolerance and integrity and I was so proud to be present to share it. Finally, it was sad to see graduates whose families could not attend the ceremony and share this important event with them, as well as disappointing to hear the names of graduates who were not able to attend the ceremony at all. So the following is our pledge from the Alumni Relations team to you all of you: every graduate of GEM will have the opportunity to attend a ceremony and officially receive their diploma in the presence of their families and friends. This is one of the most important milestones of your life and you should be able to celebrate it with your loved ones who support you. This year, GEM's 30th anniversary, the Alumni Relations events team will inaugurate the first of our "Graduate? Re-graduate!" ceremonies starting in India in December. We are scheduling these ceremonies and events in our major locations around the globe. More details will be forthcoming so remember to keep your contact details up to date. Warm regards from all of us in Alumni Relations, and we cannot wait to see you and celebrate soon!